Do Melburnians really care twice as much about sport than art? Worldwide icon-chevron-right South Pacific icon-chevron-right Australia icon-chevron-right Melbourne icon-chevron-right Do Melburnians really care twice as much about sport than art? Melbourne is known across the world as a thriving cultural hot spot. We’ve got world-class dining options, a rich arts landscape and a killer live music scene, making us one of the most exciting cities in the world for culture and going out. But we're also truly mad about sport. AFL is in our blood, the Grand Prix revs up Albert Park every year, and just this month than 780,000 people attended the 2019 Australian Open. So which is really the soul of our city? Art or sport? 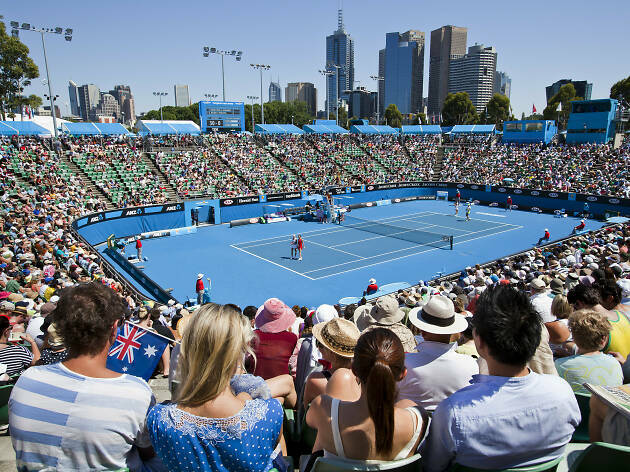 There is no denying the Australian Open is the biggest event in Melbourne's calendar (and the biggest event in January anywhere in the world). Not only did the two-week event smash the previous attendance record of 740,000 in 2018, but the Andrews government has committed to investing $271 million into another stage of the Melbourne Park redevelopment to secure the future of the Open. The number of attendees for 2019 seems even more impressive when you consider the Australian Open runs for only two weeks. By comparison, during the National Gallery of Victoria’s biggest ticketed exhibition, 2018’s epic MoMA exhibition, 400,000 people passed through the gallery – and that exhibition went on for four months. It can’t be the price tag that puts off people from visiting the NGV. Adult entry into a paid exhibition at the NGV sits at around $28, whereas a ground pass at the tennis is $49. The NGV has numerous free exhibitions as well: currently there’s Julian Opie, William Wegman and Hito Steyerl, just name a few. During the NGV's five-month Triennial exhibition (which was free), 1,231,000 visitors went through the gallery's doors, making it the NGV’s most visited exhibition in its 157-year history. Then again, these exhibitions are usually on for months at a time, and it’s possible that many Melburnians put off visiting for too long and missed their opportunity to see it. Or it's possible we're not as interested in famous modern art as the NGV thinks we are. But do Melburnians really care twice as much about sport than art? The NGV’s MoMA exhibition was arguably the gallery’s most anticipated exhibition of the last decade, with key works from some of modern art’s biggest names making the trek from New York City to St Kilda Road. This year, the Australian Open’s main advertising platform was about being more than tennis. Their “rethink tennis” campaign showed audiences that as well as tennis, the AO would be promising multiple pop-up bars, a host of live music at the AO Live Stage and even degustations from A-grade chefs at the AO Chef Series. Either way, it seems the Victorian government has committed to both sides of this coin. Premier Daniel Andrews famously went over to MoMA in New York City to petition to get the gallery’s biggest works down to Melbourne, and this year we’ll see White Night (controversially) move to winter to be part of a brand-new winter festival, which the government is hoping will boost tourism to Melbourne during our coldest months. We can see why the arts have been called in to save the day – what winter sport could possibly interest us? Melbourne is truly abuzz with activity: Here are the best things to do in Melbourne this week.